"What's in a name? That which we call a boat by any other name would sail as sweet." It's no secret that many of us feel a very personal connection to our boats. They have personalities and character that often reflect their owner's good and bad attributes. When I read the name on a boat I often wonder what the inspiration was. Other times I simply wonder, "What were they thinking!?" Evidently, sometimes they weren't thinking at all. There are quirky boat names like the sailboat called Hot Ruddered Bum. Others are strangely embarrassing like the powerboat I saw named Helmroid. And some make you think a bit before you get the name, like Never Again II. See? Nothing too terribly creative or memorable, but nothing really offensive either. Maybe BoatUS graciously censors the list so we don't see a sailboat called Bow Movement, or a yacht called Ship for Brains or a dinghy called Myasis Dragon anywhere in the top ten. Here's a few other names that make me smile, but will never grace the transom of any boat I'll ever own: Maid of Plywood (for the wooden boat aficionado), Harvey Wharfbanger (for those who chose to dock the boat after too many cocktails), Bimini Cricket (for the Disney fans out there), and Sail Bad the Sinner (for those wannabe pirates who don't know how to trim the main). And then there's Donna Lange's little Southern Cross 28 named Inspired Insanity that she sailed around the world. At first read, the name doesn't come off as anything too special. But then consider that Donna lists Inspired Insanity as hailing from the Virgin Islands. And then when you see it pictured, the canoe-stern of her sailboat plays a funny little trick with the name. See for yourself in the picture below. Inspired Virgin from the Insanity Islands? Ever get annoyed with the corporate world plastering their names on stuff that already had a cool name to begin with? This is all too common among pro sports venues. Remember Candlestick Park in San Francisco, home of the NFL 49ers and MLB Giants? Today it's known as "AT&T Park". How about historic Tiger Stadium in Detroit? The stadium is now rubble and has conveniently been replaced by "Comerica Park", in case you go to a summer ballgame to forget the frigid economy. The same plight has fallen on the America's Cup sailboats. There was a time when classics yachts like Intrepid, Resolute, and Enterprise held the cup. Nowadays, you'll find names like BMW Oracle Racing USA-17 in the record books. How about my own boat? She's named Island Bound, the name she came with when we purchased her. I like the name even though it's a bit cliche and plain. It still manages to warm my skin and focus my goals on turquoise anchorages in the lee of some palm covered beach. But maybe you're not so fortunate as me and you dislike the name that came with your boat. Don't change it on a whim! You'll need ceremony and ritual to ward off the bad luck that superstitious sailors work hard to avoid. The best renaming ceremony I've come across is this one from John Vigor. There are others, but be prepared to come up with multiple virgins and other odd and/or hard to find components! 1. 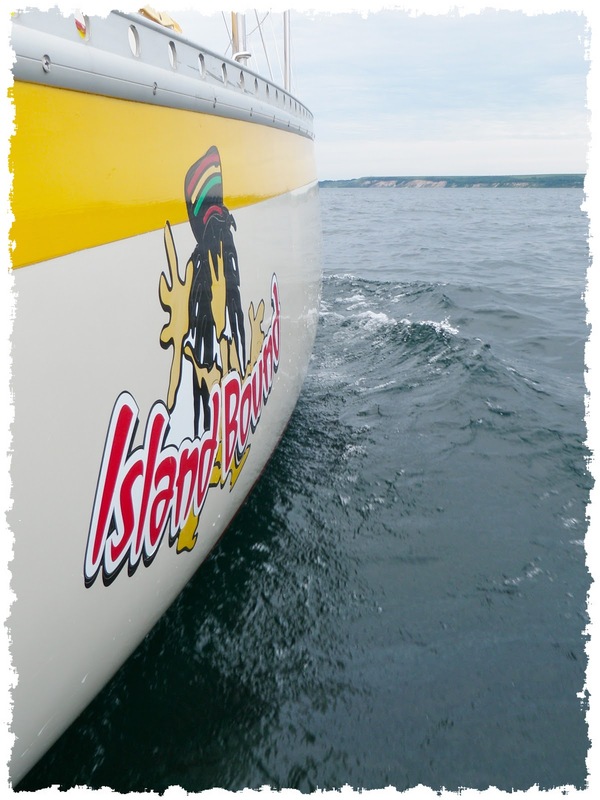 Does your boat's name have special meaning to you? I think it should. For example, a fishing boat named Reel Obsession conveys the passions of the captain. 2. Don't forget you'll have to repeat the name publicly over VHF for communications, and potentially repeat it several times for a "Mayday" call. Imagine the channel 16 chatter of these two boats: "ShipFaced, ShipFaced, ShipFaced, this is the sailing vessel Makin' Luff..."
3. Is your boat's name unique? Really, how many boats named Dot Calm or Happy Ours do we need roaming the seas? Newsflash: Using "Nauti" in the name (eg. Nauti Boyz, Feelin' Nauti, Reel Nauti, etc.) is no longer original (see the #2 BoatUS name above). 4. Don't forget about irony. I have a sneaking suspicion that boats with names like Money Pit and B.O.A.T. (Bring On Another Thousand) will soon be paying for an expensive blister repair job or the full replacement of canvas lost to a freak wind storm. 5. Does your boat's name leave you feeling inspired, proud, and in love? Mine does. Our boat's name is Sundowner, which has been her name since the previous owners acquired her in 1978. They lived on her for nearly 30 years and sailed Sundowner around the globe 3 times. It is cliche' and not what we would have named the boat if we has a boat with no name, but there is so much history and soul to this boat, and Sundowner is her name. I love the name. The boat has taken on a life of it's own. Amazing how some boats can do that. "Aquaholic" has always been a favorite of mine, but Trophy Wife feels it's just too sterotypically a power boat name. Miss Behavin and 2nd Wind are the names of boats in my current racing fleet and they are always beating me. So I don't like those names at all! Our boat is called "tilde". See http://en.wikipedia.org/wiki/Tilde - observe the shape of the character; a wave. Jarle - Very cool name. I like that you've got a symbol to go with the name. Thanks for sharing. Thanks for sharing Heather. That does sound memorable, particularly with smiley face icon. It SMILE an acronym?